With multiple things to consider when planning a reunion, group campout, party, seminar, or other event, the budget is perhaps the most crucial. All of your expenses need to be covered, and if your goal is to earn income through the event, you'll need to make sure more money is coming in than going out. Besides listing your expenses, this Event Budget Template allows you to track your event's sources of income (attendees, merchandise sales, registration fees, sponsors, etc.). 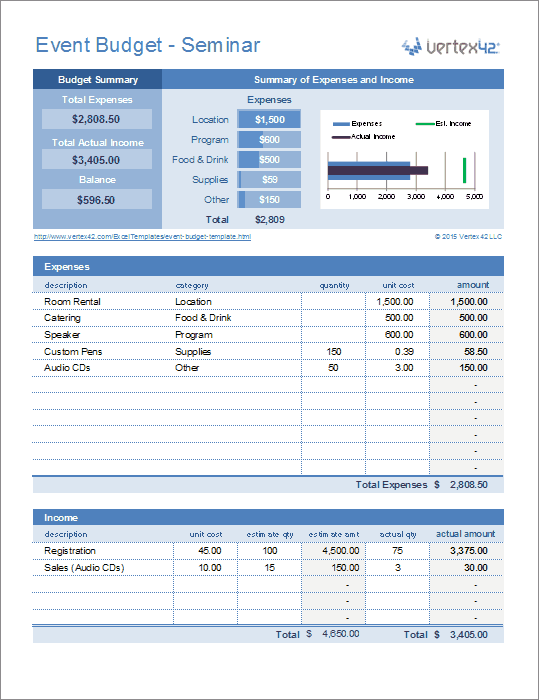 By using this worksheet you'll be able to quickly see where you can make adjustments to reach your event budget goal. Note: All numbers in these sample event budgets are completely made up. This Event Budget worksheet can be used for a variety of event types. The template includes three budget examples: a scout camp, a seminar, and a bike race. 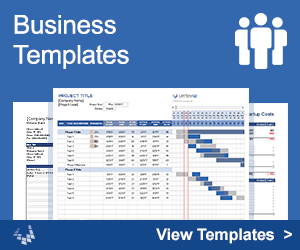 As you are filling out the template, the top section of the worksheet provides a quick reference of the event's expenses, income and final balance. In addition to seeing where your expenses are going there is a bullet chart for visualizing how your expenses and income compare, as well as showing your goal for estimated income. Figure out how many people are attending from each group. You can use the Income/Funding section to keep track of this (entering the number of people in each group in the "estimated quantity" column), but keep the unit cost zero for now. Use the "Expenses" section to list expenses, some of which may depend on the total number of people attending. You may want to create a formula to link to the Income/Funding section if that is convenient. If you have an initial source of funding available (such as an existing camp budget), enter that in the first line of the Income/Funding section. Look at the Balance listed at the top of the worksheet and divide that number by the number of people attending to determine the cost per person. Use the Income/Funding section to list the expected fees to be collected from each group based on the cost per person that you calculated.